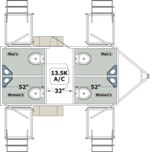 Looking for the perfect restroom, shower, or locker room trailer? Our large selection of these type trailers is sure to include the trailer you need. Choose from single axle or tandem axle in a variety of sizes and styles. Standard equipment is included in the price shown plus you can choose from a number of available options to customize your restroom, shower, combo, or locker room trailer to your needs. All trailers are manufactured in the order in which customer orders are received. Trailer manufacture times from this facility generally run between 6 and 8 weeks, but could take more or less time depending on the size and type trailer, number of options added to the order, and our work load/back log at the time that your order is placed. Champagne is our standard color for restroom, shower, combo, and locker room trailers, but you may choose from a variety of other trailer colors.